The Malaysian Tenpin Bowling Congress and the Amatuer Tenpin Bowling Association of Sarawak wish to extend their invitation to your federation/congress/association to participate in the 20th Asian Youth Tenpin Bowling Championships 2019 at the Megalanes Sarawak, Batu Kawa, Kuching, Sarawak, Malaysia from April 17 to 25, 2019. 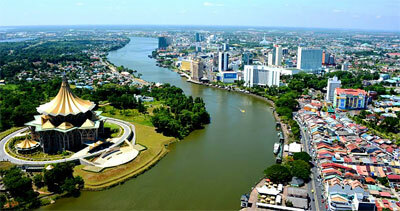 Described as one of the most attractive cities in Southeast Asia, Kuching is the State capital. It is a city rich in history, and modern day Kuching is a delightful blend of modern structures and old-world charm. Kuching is divided by the Sarawak River; the south is a commercial residential area, dominated by Chinese, while the north shore is predominantly Malay in character, with old kampong houses lining the river. The two parts of the city are very different in character and even have separate mayors and separate town halls. Kuching is known to be the highest populated city in the entire Sarawak in Malaysia. While the Bruneian Empire was in administration, Kuching was the third capital. Only after Kuching was handed over to James Brooke, it became the capital of Sarawak. While Charles Brooke was the ruler, the city kept flourishing. It saw some major development like construction of hospitals, schools, lavatories, prison and souks. World War II made Kuching a part of the Japanese province post Japanese invasion. However, the town was not damaged even after the war. The 20th Asian Youth Tenpin Bowling Championships 2019 will be conducted in accordance with Chapter 4 and Chapter 5 of World Bowling Statutes and Playing Rules as of March 2016. The Organizing Chairman and its Committee extends its utmost appreciation to the Asian Bowling Federation for its support, confidence and endorsement of MTBC/ABAS as host of this 2019 Championship. Form A (Participation Form) must be submitted on or before January 31, 2019. All room reservations and payments are to be placed through the Organizing Committee. Distance from hotel to bowling centre is about 20 minutes by car/taxi in normal traffic conditions. You may download Bulletin 1 for full information. Please contact us at Tel: +608 2685 366, Fax: +608 2682 096 or Email: abas@megalanes.com.my for more information.